Now that error message isn’t particularly helpful, particularly if, as in this instance, the site wasn’t using SSL at all. I googled the error and found this support page on the wordpress forums, only to then discover it’s not resolved. After more googling I found this post which indicated it might be something to with the jetpack/wordpress SSL certificate rather than that of the wordpress install we’re using. 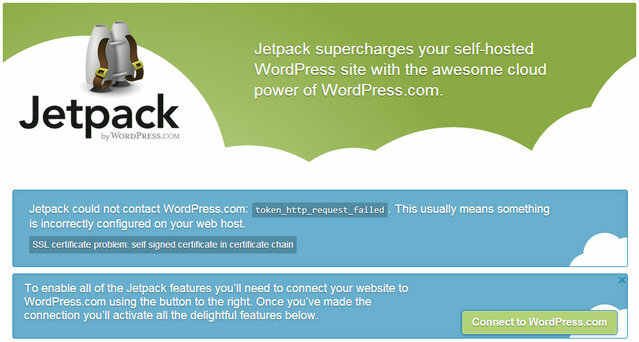 in jetpack.php does indeed seem to fix things. I wouldn’t claim to be an expert on SSL, but I think this may be down to how WordPress have decided to use Jetpack.me in place of jetpack.wordpress.com, but not updated the SSL certificate to reflect this. I may, of course be barking up the wrong tree there. Only time will tell if that causes any issues further down the road.